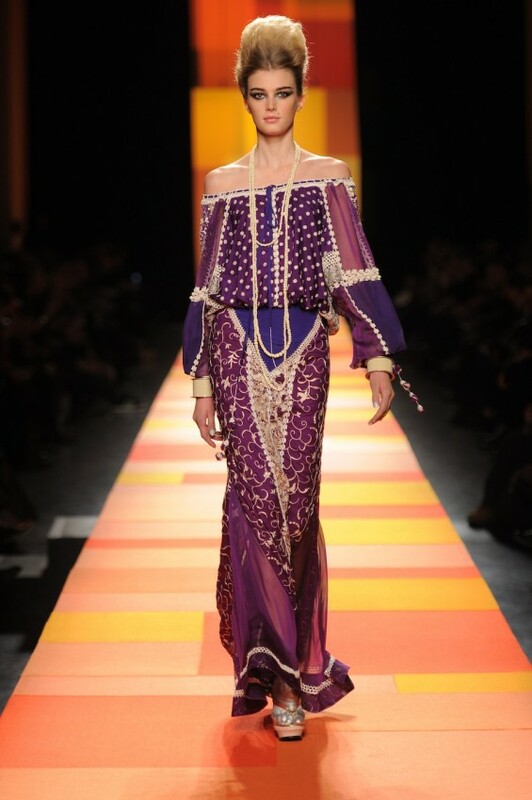 Inspired by India and the sheer beauty of their crowned jewel, the magnificent Taj Mahal, Jean Paul Gaultier sent models down the runway resembling Bollywood princesses and haute gypsies at his Spring/Summer 2013 couture show. Energy permeated throughout the grand hall as the tribal drums began to beat, a Bayadère (Indian temple dancer) burst onto the stage wearing a beautiful backless amethyst and brown plissé striped jersey gown. Similar to the classical Indian Mujra dance, the looks that followed were graceful and vibrant, exuding power while radiating elegance. Lavish embroideries, patchworks and embellishments captured the craftsmanship and sartorial splendor of each ensemble. Fish tail skirts reminiscent of a mermaid added a seductive yet lighthearted element to the collection. Vibrant colors, layered looks and that slouchy, off-the-shoulder bohemian style added to the beauty and effortlessness of the pieces. Gaultier sent his signature silhouettes down the catwalk as well—the quintessential corset, trench, smoking jacket and cone bra were in full affect with updated twists such as a trench done in gold python—Oh là là! Beaded necklaces, baby backpacks and beehive hair complete with a long braid in the back added to the glamour of the girls that strutted down the runway flaunting ferociously fringed couture. The finale—a stunning wedding dress with unexpected hidden tots that were only revealed as the gorgeous bride lifted up her gown. 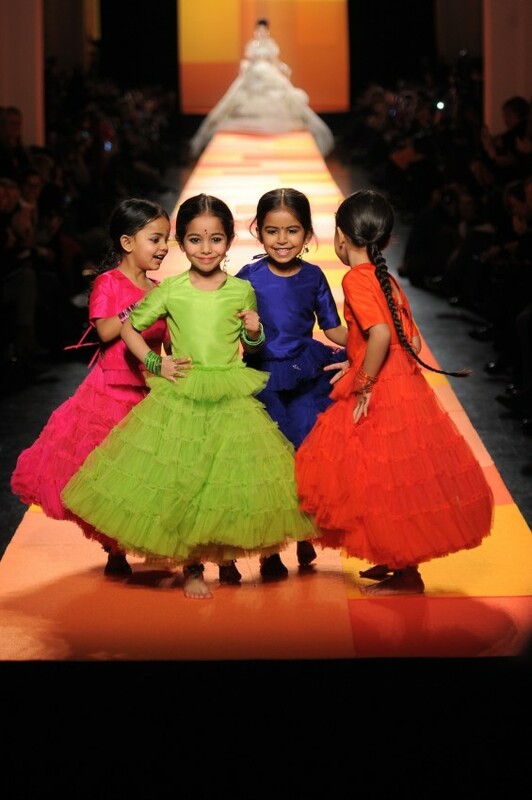 In sheer delight the little darlings ran down the runway grinning from ear to ear. 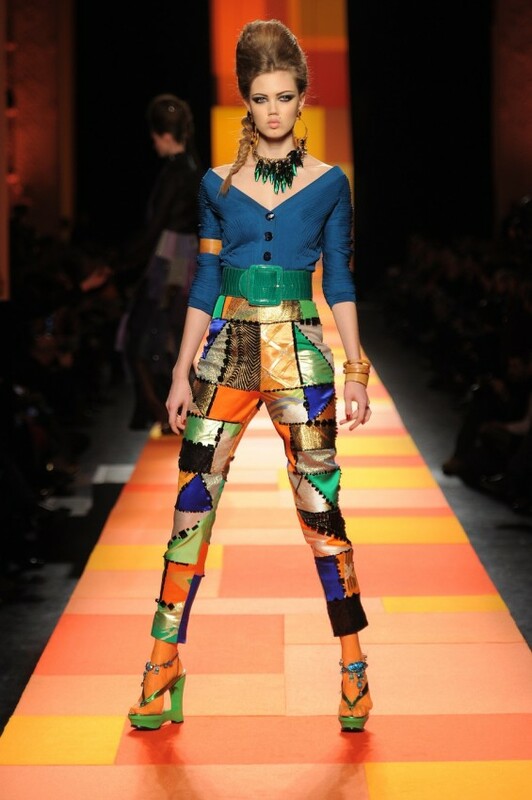 Gaultier followed suit running down to the end of the catwalk to take his well-deserved bow.